A memorial plaque to the celebrated Nobel Prize Laureate, renowned worldwide for his efforts on behalf of Holocaust remembrance, was unveiled at the Chamber of Holocaust on Jerusalem’s Mount Zion. 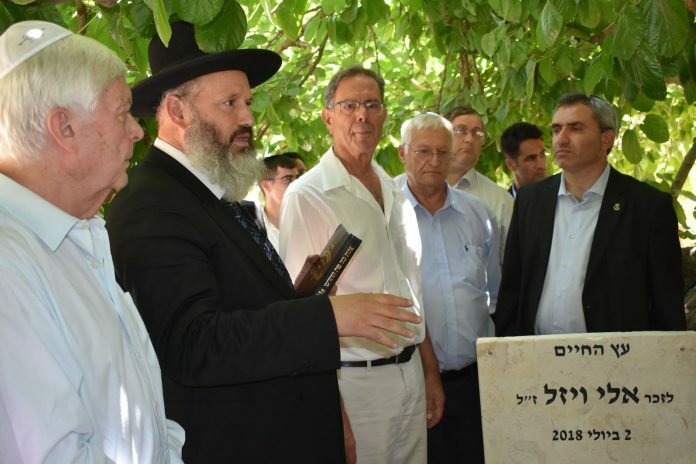 The unveiling of a memorial plaque in the first Holocaust museum in Israel (established in 1948) was initiated by Limmud FSU (former Soviet Union), the Conference for Material Claims against Germany and the March of the Living Organization. The ceremony began in the morning hours of July 2 and was followed by the unveiling of the memorial plaque right next to a “Tree of Life,” a 70-years-old fruit tree that was dedicated to Elie Wiesel. The event was held in the presence of leading dignitaries, including Ze’ev Elkin, minister of the Environmental Protection and Jerusalem Affairs; Shlomo Gur, deputy president of the Claims Conference in Israel; Chaim Chesler, founder of Limmud FSU; Rabbi Yochanan Fried; Dr. Joel Rappel, founder and former director of the Elie Wiesel Archives at Boston University; Marina Koritny, head of Aliya Promotion Department in the World Zionist Organization; Rabbi Yitzhak Goldstein, Chairman of the Chamber of Holocaust; Marina Kontsevaya, Jerusalem Council member, and other personalities.